What's better than getting a Graze snack box for free? How about getting $1.50 back from Sunshine Rewards when you sign up! Simply sign up as a new customer at Graze and you will get a 4 snack sampler box (regularly $13.99) and pay only a $1 shipping fee. After your sample box you can stay a member as short or long as you like and receive snack boxes on whatever schedule you choose (the default is weekly). You will customize each box based on your dietary needs and their snack suggestions. Gluten free or nut allergies? Not a problem! Watching your calorie counts? They are all listed on the site. 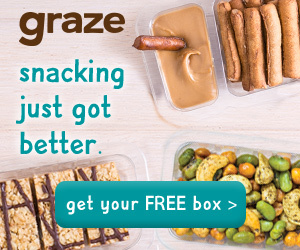 Whatever your snack prefences, Graze will help you find the perfect sample pack. I made a video showing both my sample box and my first shipment so you can see what you are getting. I love it!